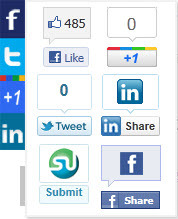 Scrolling Twitter Like Google +1 Linkedin and Stumbleupon is a social share scrolling plugin with Twitter, FB Like, Google +1, Linkedin, FB Share and Stumbleupon social icons. Options to adjust the plugin as per your site design. 1.Download Scrolling Twitter Like Google +1 Linkedin and Stumbleupon wordpress plugin. Download link. 3. Login to wp-admin. In your admin dashboard click plugins and activate the Scrolling Twitter Like Google +1 Linkedin and Stumbleupon wordpress plugin. 4. Then go to Settings menu and select Scrolling Tweet Like Plusone. 5. And adjust the settings and click save changes.